Here’s this week’s Free Fiction Friday story, coming your way from UnWrecked Press. 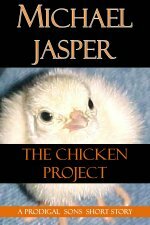 UPDATE: Now that the free week is over, you can read the rest of this story by downloading a copy of “The Chicken Project” from Smashwords or Amazon. Then you can read it on your laptop, desktop, Kindle, iPad, Nook, iPhone, or whatever device you use to read ebooks. Looking out at the muddy pasture at ten minutes past seven in the morning, inhaling the eye-watering scent of fresh manure, John Koopman figured out why he’d always hated living on the farm. Back in Chicago, he’d always been busy: moving stocks, tracking the markets, keeping careful notes on hundreds of clients. And then, after the markets closed, he’d spend hours sorting through the mess of newspapers, client files, and computer printouts strewn across his office like so much litter or hay. Back in the city, he’d had no time to stop and reflect. But here on the farm, John’s chores only involved his arms and back and legs. That left him with way too much time to think, and to remember. And there was always more work to do. Two days ago — Monday, maybe Tuesday — John had scythed the knee-high grass outside this long, narrow barn. He then strung chicken wire in a wide circle, outlining the fan of short grass. Yesterday Dad had taught him how to use the Skillsaw to cut three holes in the south wall of the barn. This morning, as the sun burned away the morning fog, John was installing the trio of used windows into the holes by himself. That rainy April day, as John squeezed caulking into the gaps between the window frames and the somewhat uneven holes he’d cut, with the small barn warming from the space heater behind him — and despite his best efforts not to do so — his mind kept returning to Chicago. That night in Jamie’s apartment. Walking up the four flights of stairs to it, John had calmed himself with the thought of a couple drinks after a particularly busy and unsuccessful day. Just about everything he’d touched that day in February had lost money. Though he didn’t know it at the time, that day would be his last day of work in Chicago. Read the rest of this story by downloading a copy of “The Chicken Project” from Smashwords or Amazon.